For most musicians, the true joy of music is sharing it. While there are millions of folks jamming in their basements with headphones and an audience of the family pet, there's nothing like the experience of walking into a venue and playing songs that put people on the dance floor, or at least to put a lot of smiles on their faces. This series from Music Minus One is a wonderful tool to help facilitate that. 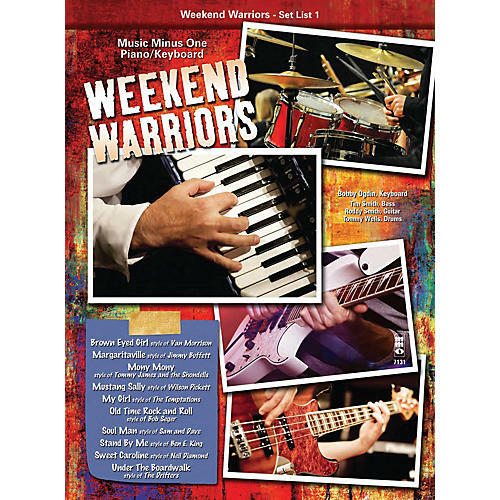 Whether you are a teenager wanting to figure out how to make some gas money on weekends, or a working band that wants to actually capture the essence of the original hits, the Weekend Warriors Set List is for you. With their matching song lists across instruments, these play-alongs are perfect rehearsal tools to put the whole band on the same page. Set List 1 contains: Brown Eyed Girl · Margaritaville · Mony Mony · Mustang Sally · My Girl · Old Time Rock and Roll · Soul Man · Stand by Me · Sweet Caroline · Under the Boardwalk.